We’d love your help. Let us know what’s wrong with this preview of Signal to Noise by Neil Gaiman. Neil Gaiman and Dave McKean present their masterpiece in a completely remastered and redesigned edition overflowing with bonus material! Somewhere in London, a film director is dying of cancer. His life's crowning achievement, his greatest film, would have told the story of a European village as the last hour of 999 A.D. approached - the midnight that the villagers were con Neil Gaiman and Dave McKean present their masterpiece in a completely remastered and redesigned edition overflowing with bonus material! Somewhere in London, a film director is dying of cancer. His life's crowning achievement, his greatest film, would have told the story of a European village as the last hour of 999 A.D. approached - the midnight that the villagers were convinced would bring with it Armageddon. Now that story will never be told. But he's still working it out in his head, making a film that no one will ever see. No one but us. To ask other readers questions about Signal to Noise, please sign up. 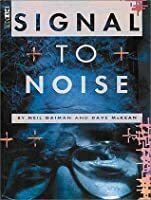 My store received a copy of this new hardcover edition of "Signal to Noise" just the other day, and before shelving it, I decided to read it. We were slow, and it's short, so I figured I could get through it in an hour or so. I'd read the story once before, though as an internet download of scanned pages rather than in an actual bound edition. At the time, I didn't really get it, and I hoped that reading it in this new edition might make it easier for me to understand. Boy, did it. The second ti My store received a copy of this new hardcover edition of "Signal to Noise" just the other day, and before shelving it, I decided to read it. We were slow, and it's short, so I figured I could get through it in an hour or so. I'd read the story once before, though as an internet download of scanned pages rather than in an actual bound edition. At the time, I didn't really get it, and I hoped that reading it in this new edition might make it easier for me to understand. Boy, did it. The second time through, I really connected with the story Gaiman and McKean were trying to tell. The more overt plot concerns a film director who has learned, at the age of not quite 50, that he's got a malignant, cancerous tumor, and will almost certainly die, and soon. He reacts to this by refusing all treatment and going home to wait for death. While sitting around his house, slowly growing sicker, he sketches out the idea for his final film, one that he now assumes will never be made. The film is about the pre-milennial tensions and social unrest that gripped Europe in the year 999 AD. He's fascinated by the idea of a culture preparing for the end of the world, one that quite obviously did not come. This dovetails with his thoughts and fears about his own death. He seems to regret having lost the opportunity to do more, to have as long a life as he'd always planned to have. This is where the concept of the title comes in--the director spends a lot of time thinking about clear ideas and plans being drowned out by the chaos and randomness of the world. McKean's cut-up illustration style on this particular book underscores this thought process to dramatic effect. What helps even more is the inclusion in this edition of a final epilogue called "Milennium". The rest of the book takes place in the early 90s, and this chapter is the thoughts, upon the arrival of the year 2000, of the woman who produced the director's movies. This chapter adds a different perspective to the rest of the book that helps make sense of it, and gives certain parts greater clarity. Twenty years ago, I picked up an earlier edition of Signal to Noise in a comic book shop. Before this book, I had listlessly followed the trends in superhero comics like many indoor-boys before me ("Robin died?" "Now Superman’s dead?" "Valiant Comics are worth more than other comics?" "Image is really innovative?"). Signal to Noise changed that. 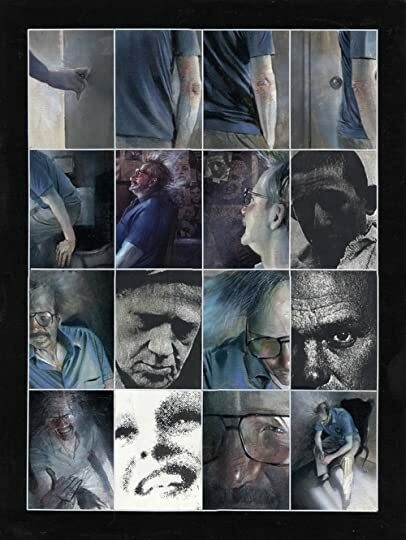 This book featured regular people struggling with the death of a loved one and their own mortality, about the reasons and nature of having an apocalypti Twenty years ago, I picked up an earlier edition of Signal to Noise in a comic book shop. Before this book, I had listlessly followed the trends in superhero comics like many indoor-boys before me ("Robin died?" "Now Superman’s dead?" "Valiant Comics are worth more than other comics?" "Image is really innovative?"). Signal to Noise changed that. This book featured regular people struggling with the death of a loved one and their own mortality, about the reasons and nature of having an apocalyptic viewpoint, the creative process, and absurd circumstances like paying a parking ticket after learning you have cancer. Philosophical themes, biblical references, historical speculation, and artists racking their brains to humanely depict all three – I had not heard of the author or the illustrator, but I liked the cut of their jib. The comic panels are paintings, nascent computer graphics and photo collages seamlessly blended into something filmic and Jungian. The book opens with a film director answering questions from an Actor’s Studio-like audience. The audience members ask the director pointed personal questions while their heads morph into animal and birds. 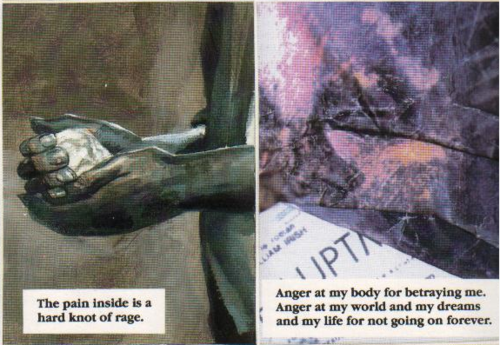 In two panels, Dave McKean manages to capture the ordinary photorealism of someone asking a question followed by the primal undercurrent underpinning a rather vicious social situation. In addition to the textual metaphors, throughout the book there are brilliant visual metaphors that morph beyond comparing two disparate things into… visual meta-metaphors? Signal to Noise represents so many firsts for me. It was my first example of what several years later became popularly called graphic novels. This was the first comic-graphic-novel-book I read that explored thought experiments and historical contexts that humanity can only make subjective guesses about. I did not know at the time that the intertextual “noise” in between the book’s sections was generated by a software version of William Burroughs’ cut-up technique, and also replicated the way David Bowie and Brian Eno sometimes create song lyrics (i.e. feeding words into a computer and selecting stylishly jumbled strings they like). I had not yet watched Breaking Bad, and seen another thin, scruffy, bespectacled, middle-aged loner attempt something grandly artistic with his remaining time on another canvas. I hadn’t read Sandman and American Gods was a decade into the future. I had not yet seen both Gaiman and McKean at play, carving out characters who risk everything for an idea, for their own survival, or while merely going about their errands. Gaiman is great at risking his characters. Any of them could die. Not in the obvious style of Joss Whedon, i.e. the sweet and funny character who everyone adores, finally falls in love, and mid-kiss is brutally stabbed by a demon. Gods, the middle-aged, pets, wives, husbands, children—Gaiman indiscriminately slaughters them. Gaiman, what a haphazard tyrant. You may love them, hate them, or feel lukewarm about them. You may know them for 300 pages or two, every character may die at any moment in a Gaiman story. This ingeniously heightens the dramatic tension, since everything is at stake for most of the characters. This edition has some new content: a few prefaces, a one-page comic by Dave McKean that was the genesis of the book, and a post-scriptum that I don’t remember, which I suspect was subsequently added. On one hand, the PS provides a post-millennial context unavailable in the 1990s and perhaps allows Gaiman-McKean to comment on their younger notions of art, creative process, death, fame, etc. On the other hand, it detracts from the melancholy, darkness, and the final joke about titles. Personally, I don’t like the PS, because while it extends the absurdity of how someone’s intentions can be forgotten, revived, misinterpreted and co-opted, it had the polish of a PR statement and a formulaic summing up that the original did not have. Maybe this is the case of an oldster ranting about how it was better in his day, and maybe twenty years hence, on my third reading, I will have fully integrated the PS, forgotten the addition, and love it. Maybe it was always there and I forgot. Who can say. Ovo je pravi vizuelni dozivljaj. This is a graphic novel from Neil Gaiman and Dave McKean. A film director from London is dying from cancer. He refuses treatment - which looks hopeless anyway - and keeps working on his last movie (sorry, we are talking about Great Britain here, so it is a film he works on). There are actually two plot lines in here: the one about the dying guy and the one about the people who exist inside his mind as a part of the film. There are some interesting ideas in here and the drawings are always top-no This is a graphic novel from Neil Gaiman and Dave McKean. A film director from London is dying from cancer. He refuses treatment - which looks hopeless anyway - and keeps working on his last movie (sorry, we are talking about Great Britain here, so it is a film he works on). There are actually two plot lines in here: the one about the dying guy and the one about the people who exist inside his mind as a part of the film. I got Signal to Noise from Netgalley, presumably for whatever release is current or about to happen. It's not great, reading it on screen: the resolution wasn't great, and I think it probably looks better as a bunch of two-page spreads. Nonetheless, it tells a powerful story, and it's a very thoughtful one: this isn't a graphic novel in the sense of comics with superheroes and over-powered fight scenes, bulging muscles, etc. This is a meditation on art and death, and consequently life. I'm not th I got Signal to Noise from Netgalley, presumably for whatever release is current or about to happen. It's not great, reading it on screen: the resolution wasn't great, and I think it probably looks better as a bunch of two-page spreads. Nonetheless, it tells a powerful story, and it's a very thoughtful one: this isn't a graphic novel in the sense of comics with superheroes and over-powered fight scenes, bulging muscles, etc. This is a meditation on art and death, and consequently life. I'm not the greatest fan of Dave McKean's art here, but it worked for this particular story. I'm a pretty hard-core advocate for drinking the Gaiman Kool-Aid. Basically, if you've met me, I've recommended Gaiman to you. I just don't meet people without in some way referencing what a supremely wonderful author he is. 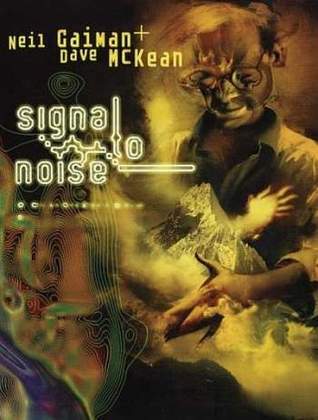 That said, "Signal to Noise" is much more a Dave McKean piece than a Neil piece, reading more like "Cages" than say "Sandman" or "Murder Mysteries." There isn't really a hint of the fantastic anywhere in the story. A man learns he is dying and tries to cope with the end of th I'm a pretty hard-core advocate for drinking the Gaiman Kool-Aid. Basically, if you've met me, I've recommended Gaiman to you. I just don't meet people without in some way referencing what a supremely wonderful author he is. That said, "Signal to Noise" is much more a Dave McKean piece than a Neil piece, reading more like "Cages" than say "Sandman" or "Murder Mysteries." There isn't really a hint of the fantastic anywhere in the story. A man learns he is dying and tries to cope with the end of the world. The film he is working on feels like the biggest Gaiman element in the piece. In other words, this is not a book I ever would have picked up from a jacket summary, which just goes to show me how little jacket summaries can be trusted. Conceptually, the book is beautiful, interjecting randomly generated noise which I can here in my head like so many jumbled radio stations. The art is obviously McKean gorgeous, forcing even a speed reader like me to slow down and take in the expansive pictures. The themes of the book are themes that resonate with my own philosophy: the idea that there is no end of The World, but there are thousands of ends of the world every second for individual people. That's why our society is so obsessed with apocalypses. We all see our own doom looming, and we project it outward to encompass all we can grasp. It's filled with noise, but the signal still comes through strong, the hallmark of both of these creators. This was one of my favorite graphic novels of all time. Neil Gaiman and Dave McKean tell (in the best possible medium) a beautiful, haunting story about mortality. The artwork will stretch your soul. Read. Please be prepared for its side effects. Illustrations and text are beautifully paired in this examination of mortality. In a story that elegantly parallels the end of the world with the end of an individual, we are asked to consider if the patterns we see are real or are imposed by our own fears and desires. And in the end, how much does the answer to that question truly matter? Signal to Noise is an exquisite example of the best that graphic novels have to offer. It defies those who fail to recognize the power of the form to reach the Illustrations and text are beautifully paired in this examination of mortality. In a story that elegantly parallels the end of the world with the end of an individual, we are asked to consider if the patterns we see are real or are imposed by our own fears and desires. And in the end, how much does the answer to that question truly matter? The story in this book is simple; a middle aged film director has been diagnosed with cancer. The story takes place almost entirely in his own flat, or inside his own mind as he writes a story of the turn of the millennium, the 999 one. It has to be said that this book came out original in shorts in 1989 so the whole millennium craze was quite big around that time. The problem with the film is that it is one he will never make as he is refusing treatment and he only has months to live. Normally I The story in this book is simple; a middle aged film director has been diagnosed with cancer. The story takes place almost entirely in his own flat, or inside his own mind as he writes a story of the turn of the millennium, the 999 one. It has to be said that this book came out original in shorts in 1989 so the whole millennium craze was quite big around that time. The problem with the film is that it is one he will never make as he is refusing treatment and he only has months to live. Normally I would not spoil the ending, but obviously he die and you know that is the end point from the moment you start reading. There is quite a lot after he dies about what happens to his story and the places it goes and I do wonder how much of it was put in because of the original success of this book. There are a mass of editors notes at the beginning detailing its original publication in 1992 as a collection, through plays, radio dramas, rewrites and redraws and on to this second publishing. So when you read through the final few pages it almost blurs that line between the story in the story and the reality of this book and its own story as it has evolved in the real world. If you enjoy a book that gives a lot of re-reading value, one that you can spend minutes on each page just looking into the art, rereading the words and trying to find hidden meanings, then you will utterly love this. However if you like to read purely for enjoyment and like dynamic art that flows with the writing, neither one requiring effort to fit into the narrative, then you will hate this and even worse, will probably not understand it. From my personal perspective, I am stuck right in the middle. I can appreciate what this is trying to achieve and I think it manages it very well, but it simply is not my idea of a ‘fun’ read. What will stay with me are the last two panels before it goes into the epilogue ‘Millennium’ and it would have been a better ending had it stopped right there. What makes this worth reading is not the story. The story is that of a dying man creating what he wants to be his legacy, working on that one last thing relentlessly, finishing it and then passing away... it's not the first time it's been done. Although this does add something more, it adds the sense of story and real life blending together. Life mirrors art mirrors life. Faced with death we stop making distinctions. What makes this worth reading is the art and the words. Not how the words create the story, but the words on their own, and the pictures on their own. Every panel is gorgeous to look at and haunting to read. It is not the whole of it that makes it worthwhile, it is the individual parts. It is the journey, truly, that you have to cherish. I admire both Neil Gaiman and Dave McKean, the former for his gift with words, the latter for his artistic talent, and how he can create such a tangible atmosphere with only pictures. I wish I owned a physical copy of this. I had to read it on my computer and it simply isn't the same. It deserves the full glory of a hardback copy. Clar, se vede scriitura lui Gaiman, dar nu se vede modul său de a construi și reda o poveste. Nu e Gaiman cel pe care-l găsești în toate celelalte scrieri ale sale. Gaiman poate să nu fie superficial? Poate. Dar trebuie să fie împins de la spate sau să-i placă foarte mult ideea pe care o are în cap. Plus că eu nu-l văd prea filosof pe Gaiman. În schimb McKean pare să aibă acea sclipire de demență specifică celor atinși de morbul filosofiei. Din punct de vedere grafic, romanul este excepțional. Îmi pare rău că nu am reușit să o citesc în original ci doar un CBR. E trecută pe lista scurtă de cumpărături și cred că e un must-have pentru absolut orice împătimit de comics-uri. I wasn't a huge fan of the artwork, however. It wasn't bad Signal to Noise is a graphic novel that left me much divided on how to rate it, and how to feel. On one hand, the story is brilliantly told. Signal to Noise narrates the struggle of a filmmaker with cancer, whose final masterpiece will go on unseen- except by those of us reading the story. It was a powerful journey, and the window into the director's head was a fascinating one. It was well worth the read, though it is a bit of a slow one. Poignant. My favorite quote "we are always living in the final days. what have you got? a hundred years or much, much less until the end of your world." I am not a big fan of Dave McKean's art but when added to Neil's words you something that is akin to art, poetry and music combined. A fascinating story about endings and dyings. A great book to read in the Winter. Quiet and contemplative. I actually enjoyed this. We all face our own personal apocalypse. This review has been hidden because it contains spoilers. To view it, click here. Una historia mínima, contada desde la perspectiva de un creador que se enfrenta a su última obra. Una reflexión sobre el acto de extraer algo de la nada como intento de alcanzar la inmortalidad. Me gusta mucho este Gaiman primerizo que todavía tenía ese aire abiertamente intelectual y místico pre Vértigo; el arte de McKean aporta ese tono fantasmagórico (me gustaría que existiera un equivalente completo a la palabra sajona eerie) que ayuda a alcanzar esa aura de solemnidad que la obra busca y nec Una historia mínima, contada desde la perspectiva de un creador que se enfrenta a su última obra. Una reflexión sobre el acto de extraer algo de la nada como intento de alcanzar la inmortalidad. Me gusta mucho este Gaiman primerizo que todavía tenía ese aire abiertamente intelectual y místico pre Vértigo; el arte de McKean aporta ese tono fantasmagórico (me gustaría que existiera un equivalente completo a la palabra sajona eerie) que ayuda a alcanzar esa aura de solemnidad que la obra busca y necesita. Una obra de su tiempo, es verdad, es posible que hoy se la puede ver como muy autoindulgente (y autoreferencial al trabajo claramente acomodado del protagonista) con el razonamiento y esquema de valores del protagonista, pero igual funciona. De todas formas funciona. This was a radio adaptation of a graphic novel written by Neil Gaiman and illustrated by Dave McKean. Something must have been lost in translation as I was left thinking "I don't get it! "—yet I'm still thinking about it today even though I listened to it yesterday. So I want to find the graphic novel to see if I can figure out what I'm missing. It's Neil Gaiman after all—there's got to be something weird and wonderful to it. Quel plaisir de lire du Neil Gaiman ! Il m'en faut encore ! The drawings are a collection of visual arts, with a script that only Neil Gaiman could get us used to. It's not happy, it's not sad, it's just an universal truth. Somewhere, somewhen, somehow, somebody's world is ending. I couldn't help but think of all the recent hooplah concerning the 12-21-12 hype and how so many intelligent people that had never wanted to admit it, had a sigh of relief once midnight came and went. So, the world didn't end on 12-21-12... or did it? but then again, wouldn't it be fair to think that that's what we'll all be thinking when our own little personal world ends? Sooner or later, everybody faces the end of their world. 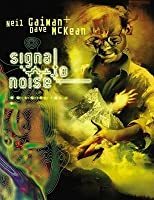 Signal to Noise is a graphic novel written by Neil Gaiman and illustrated by Dave McKean. It was originally serialised in the UK style magazine The Face, beginning in 1989, and collected as a graphic novel in 1992, published by Victor Gollancz Ltd in the UK and by Dark Horse Comics in the US. The story examines the relationship between images of an imagined World Apocalypse and the experience of one man's personal, individual apocalypse. 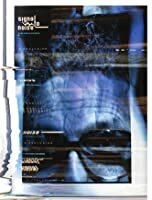 In it a film-maker learns he is suffering from a terminal illness, and imagines a last film which he will never have time to make before he dies. There have been two adaptations of the graphic novel into other media: in 1996, Gaiman adapted his own story for a BBC radio broadcast, with music by McKean; and in 1999, a stage adaptation written by Marc Rosenbush and Robert Toombs was mounted in Chicago with Gaiman's cooperation. I don't know that I'm entirely sure what to make of this comic. After reading it, I wasn't really sure what I thought. It didn't capture my imagination or speak to my heart. It is just a quiet little story of a man about to die. Nothing extraordinary. But that's precisely why, despite my initial indifference, the story lingered around me. It slows you down and reflects back to you the absurdity of life, and of death. I don't know that I understood everything. I imagine if I seriously applied myse I don't know that I'm entirely sure what to make of this comic. After reading it, I wasn't really sure what I thought. It didn't capture my imagination or speak to my heart. It is just a quiet little story of a man about to die. Nothing extraordinary. But that's precisely why, despite my initial indifference, the story lingered around me. It slows you down and reflects back to you the absurdity of life, and of death. I don't know that I understood everything. I imagine if I seriously applied myself to a literary analysis, I would discover more but for the time being, I am content to let the story hover around. This is the first graphic novel I've read. I had to give it a try, but I think I prefer regular novels, despite being both an artist and a reader. I liked the story, but you have to use your imagination even more than you do for usual books, because there are only a few lines of text to tell you what's happening. The plot is intriguingly deep -- the title refers to determining which things in our lives are important (the signal), and which are noise. The main character of the story is dying, and k This is the first graphic novel I've read. I had to give it a try, but I think I prefer regular novels, despite being both an artist and a reader. The plot is intriguingly deep -- the title refers to determining which things in our lives are important (the signal), and which are noise. The main character of the story is dying, and knows it. How he chooses to spend his time is an invitation to think about our own choices and try to understand his choice. "People need to read the inside of noise." Secondo gioiellino prodotto dalla fantasmagorica coppia Gaiman-McKean. Sul finire del ventesimo secolo un premiato ed affermato regista affronta la fine della propria vita, a causa di una malattia terminale, e la fine del secolo, scrivendo un film che non verrà mai girato sulla fine del primo millennio d.C., tra paure e superstizioni altomedioevali. Nel progressivo abbandono della vita, il regista si lascia sprofondare nelle sue visioni, splendidamente re "People need to read the inside of noise." Nel progressivo abbandono della vita, il regista si lascia sprofondare nelle sue visioni, splendidamente realizzate dal genio di McKean, mentre il rumore della vita lascia il posto al silenzio della morte. Un capolavoro, una graphic novel all'avanguardia, dalla notevole carica riflessiva (grazie a Gaiman), che fu capace di spingere il concetto di fumetto e le arti visive verso direzioni inesplorate (grazie a McKean). This review has been hidden because it contains spoilers. To view it, click here. A very sombre book. The delusions of the scriptwriter/main character initially when he became sick were very sad, certain that he was getting better. The whole book seems packed with metaphor and meaning, but how you choose to interpret it is another thing. The story that will never be told, never seen onscreen, but the writer labours at it anyhow. The oncoming apocalypse within his story, that fizzles like a damp squib. What does it mean, eh? The reader is left to decide. Much like life. I found A very sombre book. The delusions of the scriptwriter/main character initially when he became sick were very sad, certain that he was getting better. The whole book seems packed with metaphor and meaning, but how you choose to interpret it is another thing. The story that will never be told, never seen onscreen, but the writer labours at it anyhow. The oncoming apocalypse within his story, that fizzles like a damp squib. What does it mean, eh? The reader is left to decide. Much like life. Signal To Noise is a very effective graphic novel. I forced myself, due to the foreword, to not rush through the words and absorb all the pictures sloooooowly. The art is surreal. Photographs, pencil art and CGI come together to unsettle the helljeebers out of the reader. The story is really beautiful, and is one of the few that I have read that does not treat Death as poignant, beautiful, and such jazz, instead treating Death as a Full Stop. I am going to be watching 8 1/2 after this, let us see Signal To Noise is a very effective graphic novel. I forced myself, due to the foreword, to not rush through the words and absorb all the pictures sloooooowly. The art is surreal. Photographs, pencil art and CGI come together to unsettle the helljeebers out of the reader. The story is really beautiful, and is one of the few that I have read that does not treat Death as poignant, beautiful, and such jazz, instead treating Death as a Full Stop.